The Oakland Raiders are not exactly what you’d call a hot team. They’re a miserable 1-8, they have the worst point differential in all of football, and their $100 million coach is either lost in today’s NFL or tanking for a top draft pick (or both). But the Las Vegas Raiders? They’re one of the hottest franchises in all of sports. Never mind that they won’t play a game for almost another two years. 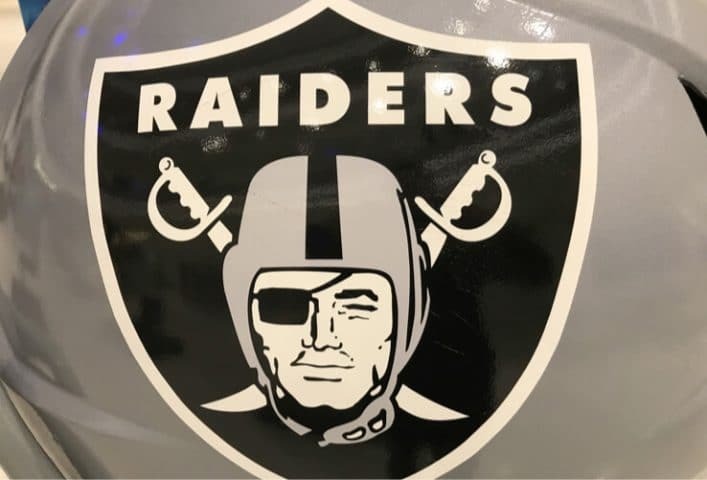 Sin City has 2020 vision, as evidenced by Caesars Entertainment Corporation nailing down an unprecedented 15-year partnership deal with the silver and black earlier this month. Notable in Caesars coming aboard as “the first founding partner of Las Vegas Stadium” is that nowhere in the press announcement was there any indication of exclusivity. If anything, the phrasing that it “marks the first Raiders deal with a gaming and hospitality company” strongly implies there will be more to come. What does this particular partnership entail? A Caesars-branded Owners Suite, unique stadium access for Caesars customers, a branded stadium entrance, and various forms of multimedia signage and advertising. That’s a start, but there’s plenty of room for other gambling companies in one form or another. Multi-million dollar corporate alliances are just one small piece of the potentially massive economic impact of the Raiders digging their cleats into Vegas. A study of the economic impact of the Raiders and their stadium by the Southern Nevada Tourism Infrastructure Committee said that although the 65,000-seat indoor stadium would cost an estimated $1.9 billion, including $750 million of public money, the annual economic impact is projected to be $620 million. There’s construction employment, there are new permanent jobs, and there’s an increase in visitors and hotel stays (research suggests that stadiums do drive economic development in strong tourism locations). It all adds up to the cost of the stadium being paid off in about three seasons of football, in theory. Until then, however, there is some public backlash to the investment. “People were ecstatic about getting the Raiders at first,” Dalla explained. “But then, the devil’s in the details, so when the stadium deal came about, there was a lot of controversy as to who’s going to pay for the stadium. There was some resentment because this city is struggling financially in terms of trying to keep up with its infrastructure and education and all the people living here, and here we are allocating hundreds of millions of dollars to a rich NFL team owner. Another negative that Las Vegas residents and regulars are bracing for is stadium traffic. The stadium is located just off the Strip, at Interstate 15 and Russell Road. (And you can watch it going up, live, from anywhere at any time.) Every stadium in every city sees maddening levels of game-day traffic, but if you’ve ever been caught in gridlock on the Strip, you know the potential for going-nowhere road rage is especially great in Vegas. Parking is already shaping up to be an issue, as the stadium is setting up remote lots with shuttle services anywhere from about a quarter-mile to a couple of miles away. Fortunately, the Raiders’ stadium will be walkable from the south end of the Strip, especially once it hits October and the extreme summer heat is fading from view. One way in which location doesn’t matter much is the marriage between the Raiders and sports betting. Maybe there will be betting windows, or at least electronic kiosks, in the stadium, but even if they don’t go that route, people can already place bets on their mobile apps. And maybe by 2020, Nevada bettors won’t even have to have opened their accounts in person at a casino. The timing is perfect. On May 14, the Supreme Court overturned PASPA, opening the door for states other than Nevada to legalize and regulate sports betting, so the expansion of that vertical and the arrival of an NFL team in Vegas seems likely to give America something of a signature sports betting franchise. Certainly, the September handle and revenue numbers in Nevada indicate that the Las Vegas sports wagering industry is doing just fine in a post-PASPA world. “We saw this when riverboats came online and all of a sudden you could gamble in Iowa and Illinois and Mississippi, and places that you never could before,” Curtis said. “Everyone was like, ‘Oh, this is going to be terrible for Vegas.’ And it turned out to be the opposite. It was good for Vegas. Gambling became mainstream. And everybody wanted to come here. For decades, the biggest sports draw in Vegas was major boxing matches — particularly heavyweight championship fights. As the heavyweight division shifted away from American control around the turn of the millennium, with Lennox Lewis and then the Klitschko brothers emerging as the dominant (and frequently dull) figures, smaller boxers (like Floyd Mayweather and Manny Pacquiao) picked up some of the slack and MMA absorbed the rest of the mega-event attention. With eight home games — plus two home preseason games, possible home playoff games, and maybe eventually a Super Bowl — those Vegas mega-events are about to become a lot more routine. That seems like a safe prediction, especially if the much smaller scale Golden Knights are any indication. “All of us were surprised by not just the success of the Golden Knights, but also the absolute devotion that this community exhibited toward the franchise in such a short period of time,” Dalla added. “Even as the Golden Knights are struggling a bit this season, the buzz is the same. I see Golden Knights jerseys everywhere, I see bumper stickers, I see ‘Vegas Pride’ signs everywhere.